HACKETT celebrated the grand opening of its store in Saudi Arabia alongside Car Maker Aston Martin at an event on Tahliyah Street, Jeddah. Part of Hackett Tradition with Aston Martin, Sheikh Abdullah Binzagr arrived at the event in an Aston Martin to open the store officially to the public, as guests were invited to the store to partake in the Quintessential ‘Hackett’ experience. Hackett designs are quickly becoming staple wardrobe pieces. Smart casual is redefined through Hackett’s use of bold patterns, fabrics and tribute to British heritage. Located on the ground floor of the Yamama Building, the full range of the brand’s collection is displayed by themed concession. From Hackett Mayfair to Aston Martin Racing, the store interior takes one through the different personas of the Hackett man. The store also includes a “Little Briton” section for the younger Hackett customer. Stationary globes, vintage first editions, and travel trunks are some of the many accents that help realize the “Hackett Experience”. Mannequins are posed as off-duty professionals throughout the store and showcase the versatile nature of the brand. 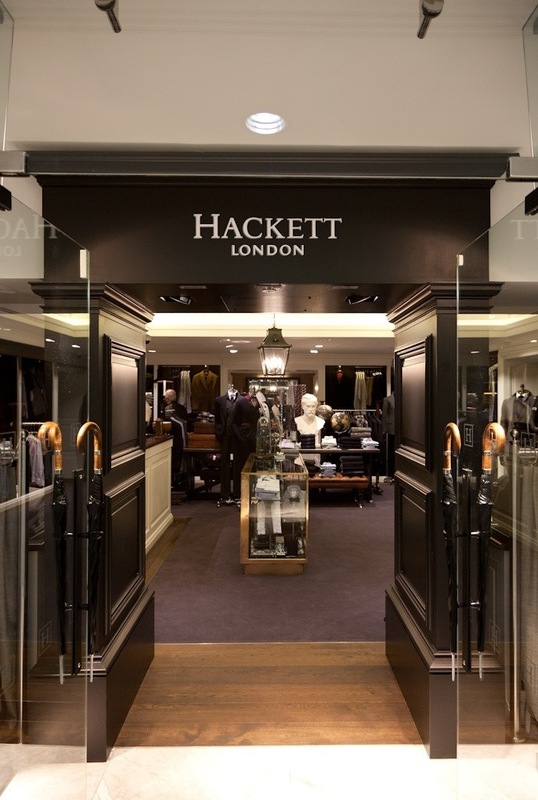 The store design maintains Hackett’s quintessential British image through a skillful blend of contemporary accents and relics. Posted on January 9, 2014, in #middleast, #retail, #uk. Bookmark the permalink. Leave a comment.